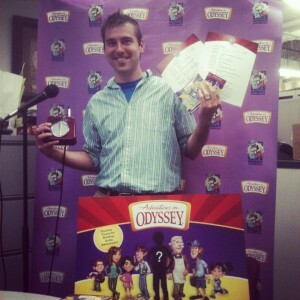 Adventures in Odyssey marketing manager Brock Eastman poses with a "Get in the Show" kit, which will be displayed at Christian bookstores on the national level. It’s official! As the Get in the Show contest approaches for fans to participate in a national audition for an upcoming role on Adventures in Odyssey, final preparations are underway and time quickly approaches the first “Get in the Show” event. On Saturday, May 19th, the first Get in the Show auditions will take place at Focus on the Family in Colorado Springs. If you’re in the area and plan on participating in this big event, why not start it off with a bang at Focus’ headquarters? Adventures in Odyssey marketing manager Brock Eastman’s book release of Risk will coincide with this fun event for families. Fans will be able to participate in the audition and obtain an autographed copy of the second book in Eastman’s The Quest for Truth series. As Get in the Show approaches nationally in July, excitement for both this and the upcoming live show is sure to follow. 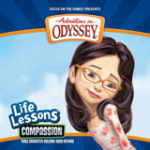 After all, who wouldn’t want to voice a character for Adventures in Odyssey Album 58 and be the spokesperson for the show in 2013? Learn more about Get in the Show here.